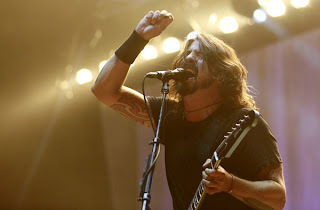 Though he's drumming on their new record, Dave Grohl told New York's 101.1 WCBS-FM that he won't be touring with Queens of the Stone Age when they hit the road behind the upcoming album. But Them Crooked Vultures, his group with QOTSA leader Josh Homme and Led Zeppelin's John Paul Jones, may tour again. "It was one of the highlights of my life when John Paul Jones said, 'Now I've been in two great bands.' That was a huge deal for me!" said Grohl. "We've talked about it, I know that someday we'll get back together and do stuff, because we love playing with each other."